Perched atop a rocky hill, the Falaknuma Palace in Hyderabad reaches up to the sky unabashedly. It offers a panoramic view of the city of pearls and a chance to live like the Nizam, the city’s most well-known dynasty who ruled for over 228 years in the city’s 400-odd year history. Today transformed to it’s erstwhile glory, it is Taj property where guests are treated to a gala time of luxury steeped in thoughtfulness, surrounded by delectable vintage pieces and food that would utterly surprise the Gods. As one of the most premium properties in the country it holds its fort in making a remarkable impression on its guests. Living life king-size is a dream and a rather wonderful dream at that. 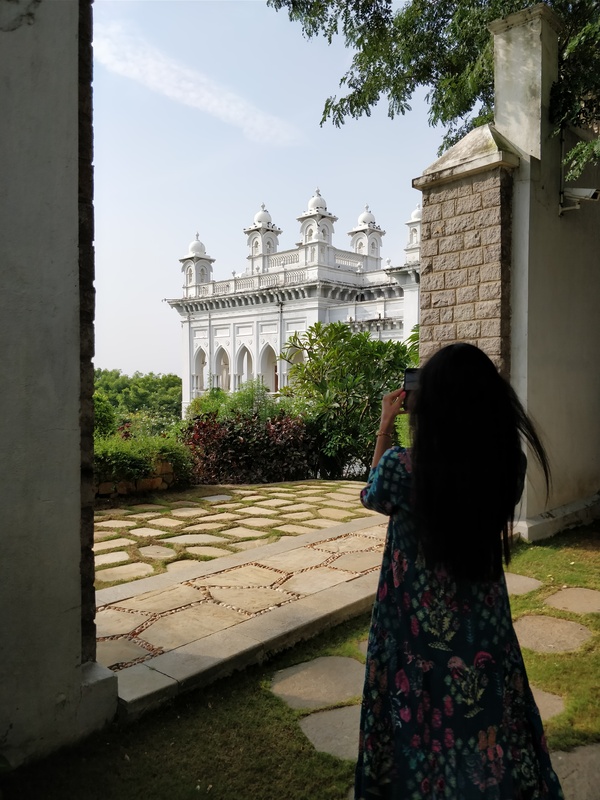 For one 24 hours at the Falaknuma is just that, a day like the king, relishing the riches and possessions of the king who was once the richest man in the world! Making a reservation at this palace is a must as no walk-ins are ever allowed. Access into the palace precincts is itself keenly monitored and documented. Once in, the guests are asked to alight at the second line of defence for a horse-cart ride upto the main palace. Vehicles are kept away from the main palace, completely. The carriageway ride on the cobbled street in high incline is quite bumpy, but the scenery breathtaking. The carriage is preceded by a man carrying the Nizam’s coat of arms. Royalty quite begins right at that point. Alighting at the entrance, the welcome with a glass of refreshment if followed by the climb up to the lobby, rose petals showered from above offer a surprise welcome, and are a shower full of the sweet smelling flower with fragrance and visual delight enveloping the stairway. While one is yet taking in the sheer grandeur and beauty of the palace, one is welcomed into the verandah adjoining the sky room and later the main lobby of the palace. While the main palace has been restored to its original glory, the wings of rooms have been redesigned to offer world-class facilities all equipped for the modern times. The rooms are all tastefully done, while the suites do have an element of bling in terms of decor and finish. What with all the gold-plated sanitary fittings! Some remarkable elements in the palace are the huge collection of books of the Nizam, his private den, the 101-seater dining table with cutlery et al, the ball room where all state functions were once held, the old dial telephone (the Nizam had the viceroy on speed dial! ), the bath for the Begum and grand proportions of architecture that was inspired by travels across Europe, Italy in particular. The palace collections are very spectacular in their historical significance and workmanship. The man who originally built the palace was a wealthy businessman Vicar-Ul-Umra who was then the Prime Minister of the Hyderabad state. His indulgence in the palace is said to have bankrupted him, causing him to sell the building to the smitten Nizam. Shaped like a Scorpion in plan it was designed to mark it’s owner Vicar’s zodiac sign. Though the plan is not read while experiencing the palace, several other measures of how the city is framed is more keenly observed and felt. Falaknuma in literal translation means ‘mirror of the sky’ and the palace does just that. It reflects the clear blue sky in the day and reflects the dazzling the lights of the city below in the night. It offers a wonderful sight to behold day or night. While we lounged for a bit, walked around the main building in the afternoon, took the palace Champagne tour, heard nostalgic stories of the city, read up about the Nizam’s jewels in the impressive library, were entertained to Sufi music in the evening, watched a great DVD show at night (accompanied all with nachos and coke! so very thoughtful), gorged on Italian for lunch, Hyderabadi for dinner and a continental breakfast, swam and spa-ed in the morning, played a game of croquet in the early afternoon, returned traditional Nizami greetings of ‘Adab’, we were constantly made to feel nothing short of the Nizam and his Begum! A befitting experience of Nizami royalty, all in the name of the king!